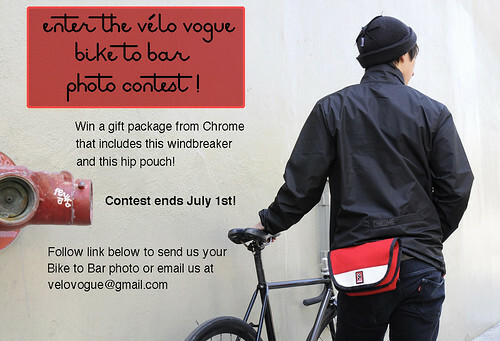 Vélo Vogue: Last Day to Enter Bike To Bar Photo Contest! It's the last day of our Chrome Bike To Bar contest and we are still accepting submissions. If you need a little reminder on the rules, here ya go! Join the Bike to Bar Photo Pool! Prizes include Chrome Windbreaker, Hip Pouch and Wool Socks. 1) Upload a head-to-toe photo of yourself with your bike in front of a drinking establishment to our Bike to Bar Photo Pool between June 1 and June 30, 2010.